It is Now June. Do You Like Rainy Days? My mum was a little concerned the other day as it had not rained enough so far and her region might suffer from a shortage of water later this year…But you would agree that many of us do not enjoy rainy days. Delays in public transport, no biking, wet clothes, wet shoes and wet bags… feeling so blue! I would like to introduce, you may already own one though, something which may cheer you up a little on such gloomy days. An umbrella born in the Netherlands where people are used to constant rains and the wind. The product has been already launched in the Japanese market for 5 years by now. The umbrella was developed based on aerodynamics by 3 students in Delft University in the Netherlands. The first 10,000 pieces were sold out within 9 days! The first thing you notice about the umbrella is for sure its form. It does not have a traditional round shape but has rather long quirky tail; front is short and the back longer. But this shape allows you to cover your back from rain drops. 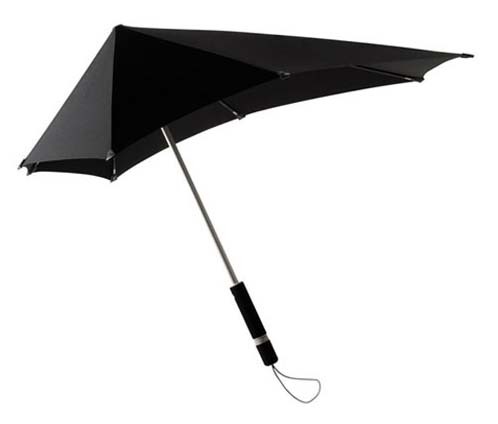 The umbrella can resist the wind blows at 60km/h without getting blown inside out. The light, highly-durable frame is made of flexible glass fiber. The ingenious shape allows also you to have a good view. This is definitely a breakthrough!